Just hours after lawyer Brian Conroy unearthed several Apple trademark filings, including iPhone 7, iPhone 7 Plus, Iris Engine, AirPod Case, Touch Bar, Smart Button, Control Strip, and more, MacRumors reader Ryan Simmons has uncovered additional trademark applications for "A10 Fusion" and "iSight Duo" filed in Brunei. 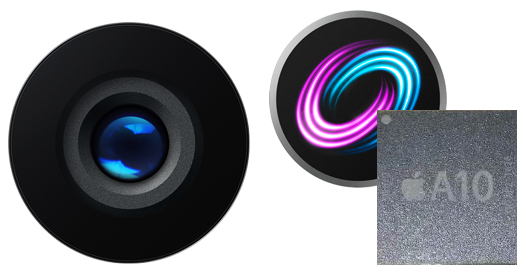 "iSight Duo" would be a logical name for the iPhone 7 Plus' widely rumored dual-lens camera system, but what "A10 Fusion" could represent is less clear. Both the iPhone 7 and iPhone 7 Plus are expected to have faster A10 chips, while Apple's only use of "Fusion" is for the Fusion Drive, which combines flash (SSD) and hard drive (HDD) storage into a single volume on select iMac and Mac mini models. Both trademark applications were filed on June 8, 2016, while Simmons also uncovered recent trademark filings for "Depth" and "Writeboard," which could be features or functions related to the Apple Pencil. Assuming the "iSight Duo" dual-camera system has one telephoto lens, as rumored, "Depth" could alternatively pertain to depth of field photos on iPhone 7 Plus. It is likely that Apple's announcements at its iPhone event in San Francisco today will shed light on at least some of the trademark filings uncovered over the past two days. The keynote begins at 10:00 a.m. Pacific Time, and MacRumors will be providing live coverage of the proceedings. but what "A10 Fusion" could represent is less clear. Both the iPhone 7 and iPhone 7 Plus are expected to have faster A10 chips ('https://www.macrumors.com/2016/08/10/apple-a10-chip-first-photo-weibo/'), while Apple's only use of "Fusion" is for the Fusion Drive ('https://www.macrumors.com/2012/10/23/apples-new-fusion-drive-not-a-typical-hybrid-drive/'), which combines flash (SSD) and hard drive (HDD) storage into a single volume on select iMac and Mac mini models. 128GB 5400 rpm Hard Drive+10GB SSD coming to iPhone!! Hard disk in iPhone confirmed! It's all about the fusion. Or maybe it's just what they're calling the tech in the A10 that "fuses" two separate images into one Super Image™ ! maybe it's just the codename? did they have trademarks for the old cpus? Makes me wonder if they're going to put an A10 chip in low end Mac Minis and iMacs. A10 Fusion could possibly mean big.LITTLE processor architecture? Control Strip. Could the new MacBook Pros indeed be coming in 2.5 hours? "A10 fusion" - maybe an indication of a file system for iOS?